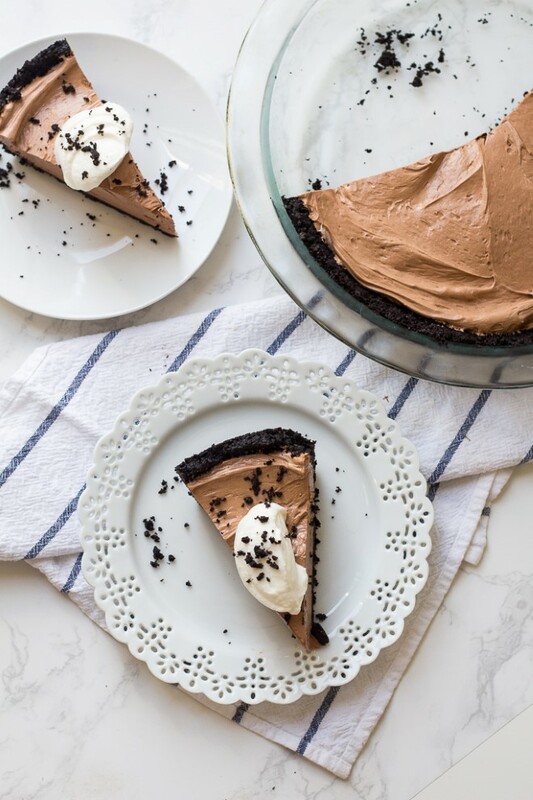 A no bake nutella cheesecake only requires 3 basic ingredients. Nutella, cream cheese and Cool Whip (Or Heavy Cream). 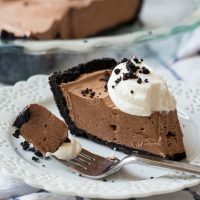 After you have your crust made, beat the cream cheese and Nutella until smooth and then gently fold in a tub of cool whip or 1 cup of heavy cream that has been whipped. You’ll still need to plan ahead since it will need to chill for a couple hours before serving, but no baking time is required. And no worries about a water bath, cracking or that other nonsense. I was originally thinking this would be a great Valentine’s Day dessert for a group a friends. My husband doesn’t like Nutella so it won’t be a romantic dessert for the two of us. Plus, it makes so much it wouldn’t be a good dessert for just two people. As I was eating it, I thought this could be my go to dessert all summer long. No bake desserts are perfect for summer and this one is cool and creamy. Substituting peanut butter would be a great way to switch things up. And I wish I would have tried it frozen. I think it would be delicious frozen in the summer. The recipe below calls for Cool Whip or Heavy Cream. Cool Whip makes things easy in a pinch, but I understand not everyone likes to use it. 1 cup of Heavy Cream can be substituted for the cool whip. Simply whip the cream with 2 tablespoons of powdered sugar until stiff peaks form. Then gently fold the whipped cream into the Nutella cream cheese mixture and proceed with the directions. A no bake cheesecake party would be fun. If you’re looking for other flavors of no bake cheesecake, my no bake blueberry cheesecake is the most popular. And if you’re a cookie butter or biscoff fan, you can miss my Biscoff No Bake Cheesecake. Do you have another other flavors of no bake cheesecake you want me to test and post a recipe for? I’m thinking lemon blueberry, cherry or peanut butter sound good. And if you’re scouring the internet for decadent Nutella desserts I have got you covered with some other ones. Nutella brownies for 2 (or 4). And a rich Nutella Hot Fudge that is amazing on vanilla ice cream. And I can’t forget this Nutella S’mores Cookie Pie which everyone will love. 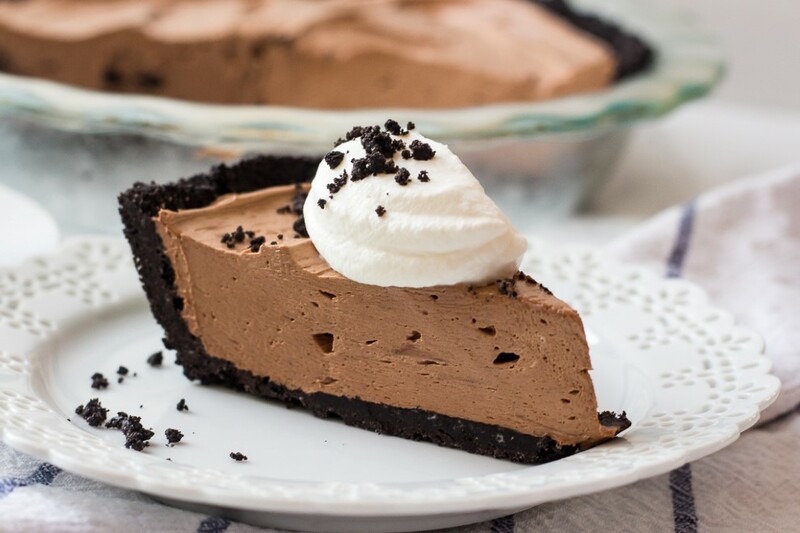 Let me know if you make this easy no bake nutella cheesecake pie. Tag me #chocolatewithgrace on Instagram and be sure to follow me there. 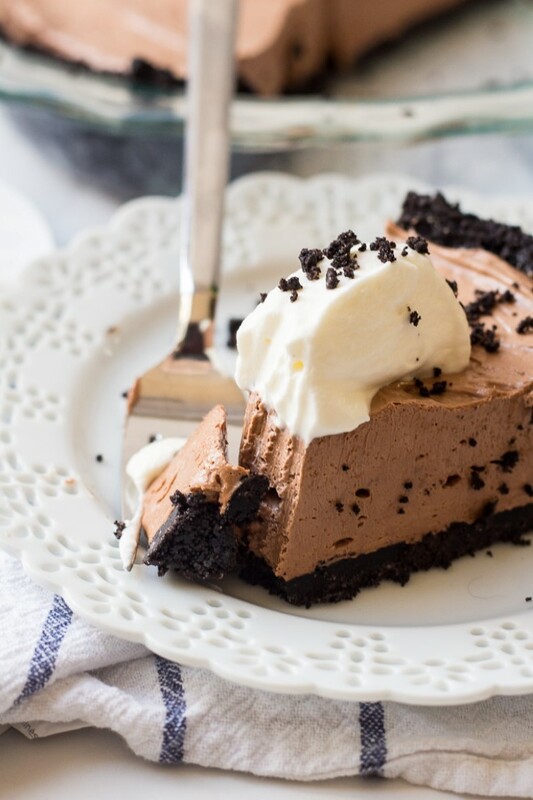 This No Bake Nutella Cheesecake Pie with an Oreo crust is a Nutella lover's dream. 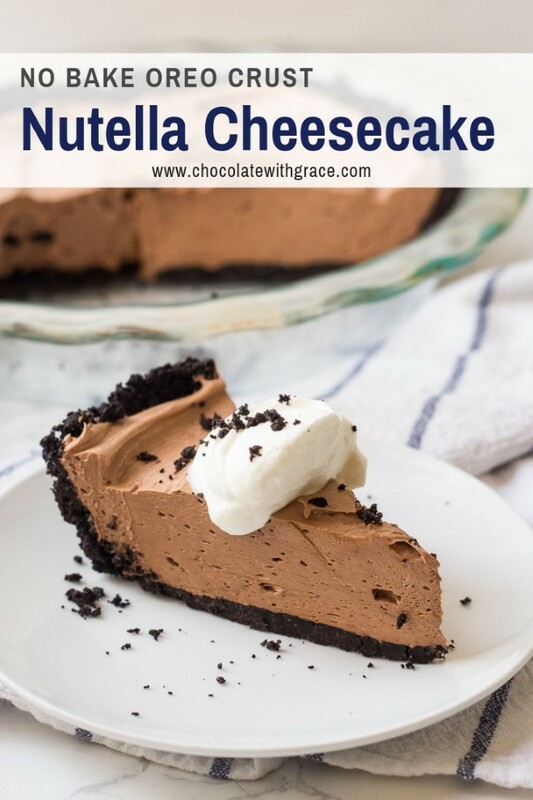 It's an easy nutella cheesecake recipe because it is completely no bake and requires just a handful of ingredients. 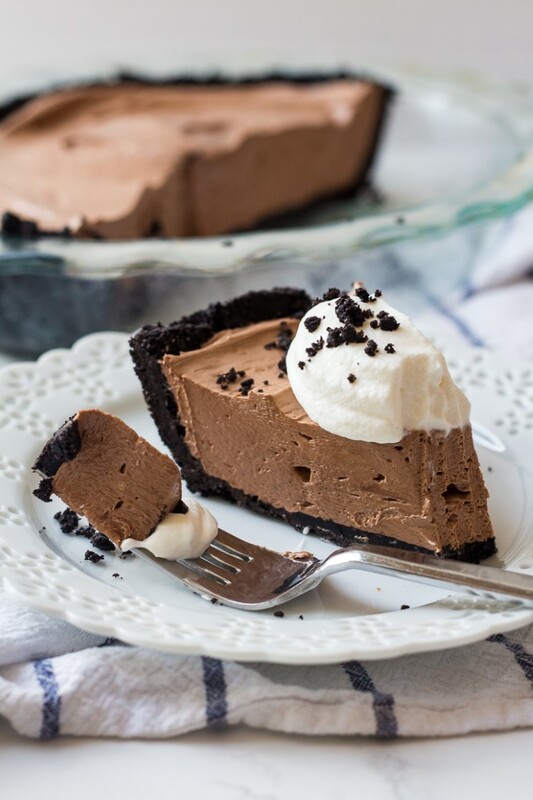 To make the crust, combine the 3 cups of crushed Oreos with the melted butter. Press firmly in the bottom and up the sides of a 9 inch pie plate. Place in the refrigerator while making the filling. In a large mixing bowl, beat together the Nutella and Cream Cheese until smooth and creamy. Gently fold in the cool whip (or whipped cream if substituting) until just combined. Smooth the filling into the prepared crust. Cover and refrigerator for 4 hours. Top with whipped cream or cool whip just before serving. It keeps several days in the refrigerator. I cut it into 10 small slices because it is a rich pie. Instead of using cool whip, you can use heavy cream. Simply place 1 cup of heavy cream and two tablespoons powdered sugar in a large mixing bowl and beat until stiff peaks form. Gently fold into the filling in place of the cool whip. 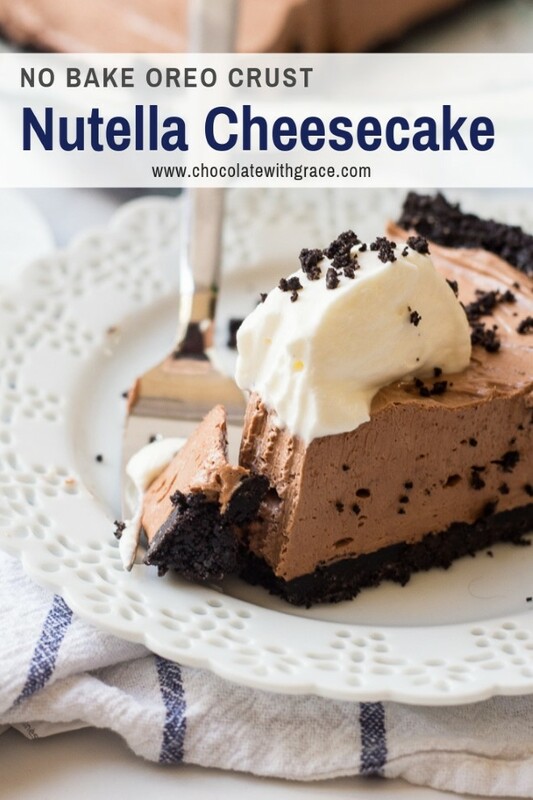 Here are some other Nutella desserts from other bloggers I would love to try. This Nutella Tart from Sally’s Baking Addiction looks over the top decadent. This was so delicious and I love that there’s no baking involved…so easy!! This is the BEST no-bake cheesecake!! I love the Nutella…anything with Nutella is amazing! This looks so dreamy and amazing! Such a simple dessert that’s sure to impress! This cheesecake was absolutely amazing! I love how easy it was to put together!